Neighborhood kids that went to school wearing new fall cardigans and jeans will be coming home to put on shorts and run barefoot. Still, a news story reported that the weather is going to change shortly and the s- word is coming. The reporter said it that way – the S-word. It was enough reason to change into my gardening clothes and bring in the harvest. I can harvest my teeny weenie vegetable garden in a couple of hours. Maybe vegetable patch is a better way to describe what I have going at the top of the yard. 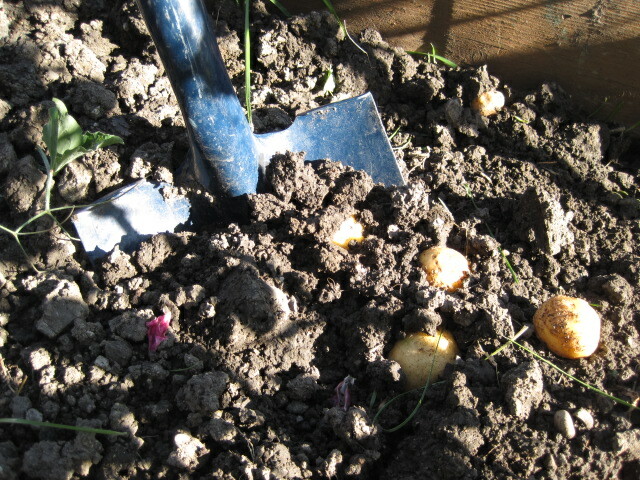 I planted potatoes in the spring for the simple joy of digging them up – it’s like a game of hide and seek. A kid from the coast might like to chase clams on a sandy beach, digging into the wet sand where they see a spray of salty water spurt up. A kid from the prairie has to make do with digging up spuds. But it’s a sport to see what’s down there in the dark earth, hiding from the slugs and weather. With my measly three dozen potatoes piled on the kitchen counter I considered letting the whole vegetable patch be poppies and sweet peas next year – maybe just a corner designated for the rhubarb. 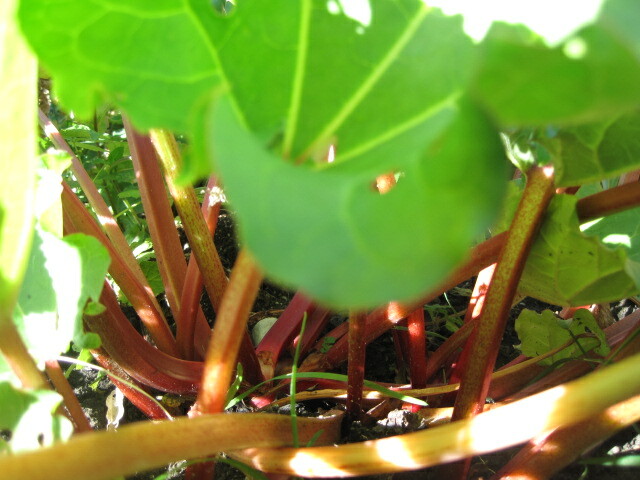 Not being a big fan of rhubarb, even baked into a sweet strawberry pie, I could take it or leave it, but I love the way the phallic shoots pop up first, announcing spring. Contemplating what other flowers I might add to the mix I started to unearth the carrots, pleased that the green tops were pulling out of the ground with the orange spears still attached. Suddenly the farmer genes that my grandparents passed along were winning out – I knew that I would poke a small variety of seeds into the ground again next May. It wasn’t the sight of the muddy carrots, that convinced me to continue – it was the sharp sweet scent, a scent you can’t quite pay money for at the grocery store. A scent that made me think of being seven-years-old and my mom washing garden carrots off with the hose and treating us to the first ones big enough to warrant pulling out on a hot summer’s day. My Grandmother – Nanny – to all our family, started farming on her own homestead at age sixteen when she married my grandfather. And after they retired to town, she tended a gigantic backyard garden brimming with peas and beans, carrots and onions, beets and raspberries – until she was ninety-four-years old. She saved money by canning and freezing her bounty. I carry on the gardening tradition in my two small raised beds, even though my little effort probably costs me more in seeds and water than it saves over the half dozen meals it supplies. 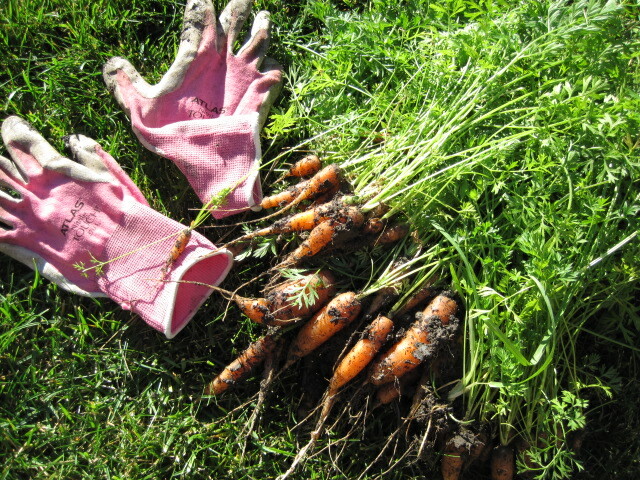 I put away the shovel, rinsed off some of the small sweet carrots, and sat on the grass in the late afternoon sun to crunch on them. The planting, tending and harvest are comforting rituals – marking one season passing before the long winter and the anticipation of the spring to come. But right then, I relaxed on the lawn that will soon enough be white with snow and embraced the glory of the autumn sun. I loved this Candy! Stuck at MRU waiting for Dale to pick me up. Talk later! Even if you had not included the wonderful photographs, we would have had a clear image of your day and your harvest. I can see you, though we have never met! The autumn here in Calgary, Alberta (close to Banff) was unusually long and warm so the leaves still clinging to the branches, are a crazy riot of color – the glory continues.